Are you in the market for a brand new DOCSIS 3.1 Gigabit cable modem? The thing about cable modems is that while there are several options available, there are only a few that are truly worth your money. In this article we will review and compare the three best Gigabit cable modems (in our opinion) in the market right now. These are Arris SB8200, Netgear CM1000 and Motorola MB8600. Which is Better: Arris SB8200 or Netgear CM1000? Which is Better: Netgear CM1000 or Motorola MB8600? Comcast Xfinity and Xfinity X1, Cox, Mediacom Cable, WOW, Grande Communications, Charter Spectrum. Can support above Gigabit speeds in future? The above models are all great products and are certainly excellent choices for the newest Gigabit Internet packages to fully utilize the service. Next in the article we’ll tell you what’s good about these cable modems and what’s not, compare their features and give you suggestions which model is best in our opinion. More and more people nowadays prefer to buy their own modem (and WiFi router) instead of renting the one provided by their ISP. This helps in saving considerable money in the long run. Therefore, to help you out, at the end of the article we describe what to look for when choosing a cable modem, which characteristics are important etc. Now let’s take a quick look at the three best gigabit cable modems on the market. Arris is one of the leading manufacturers of home networking equipment. Their cable modems are favored by almost every ISP out there. The Arris SB8200 is easily the most advanced router they have made so far. The SB8200 is certainly not a cheap device, but it is future proof and has all the bells and whistles you’d expect from a top-rated cable modem. It gives you very good upload and download speeds and is compatible with almost any top-tier ISP internet plan. Its important to note that most ISP companies have the ARRIS modems included in their compatibility lists, however you should always talk to the ISP to make sure your exact model is supported. People consistently report this modem as working great with the Comcast Gigabit Internet service and achieving speeds of around 950 Mbps download (you will never get actual 1Gbps on any Internet service). This device is powered by the Broadcom BCM3390 chipset, considered by many to be the best in its category. Actually all three modems in this article use the above chipset which managed to solve many problems of other chipsets such as the latency bug of the Intel Puma 6 chip. The SB8200 has two Gigabit Ethernet ports, and supports link aggregation. This means both Ethernet ports can be connected as a bundle (called LAG – Link Aggregation Group) to achieve download/upload speeds of 2 Gbps (max). However, link aggregation in cable modems still remains a technology of the future as there aren’t that many ISPs (if any) that are capable of supporting it. You must talk to your ISP to make sure they support bundling of two or more LAN gigabit ports. The SB8200 is easy to set up and easy to use. You shouldn’t find it hard to get started with this device, just follow the instructions in the manual that comes with the box. You will probably need to call your ISP to register the modem for you (maybe you will need to give them the MAC address of the modem found on the device). One issue with this modem is that it gets a little warm when you use it for too long (not hot though). Apart from that, this is a very good DOCSIS 3.1 modem and gives you spectacular internet speeds when combined with a Gigabit WiFi router. Moreover, by having 2 Gigabit LAN Ethernet ports, it gives you expansion options for the future. If for example your ISP starts supporting more that 1 Gbps internet speeds, the modem will be able to accommodate that increase in speed by using link aggregation of the two LAN ports. The Broadcom BCM3390 chipset is the best in the business. Has 2 x Gigabit Ethernet ports (future proofing your internet connection). ARRIS models are compatible with most ISPs in USA and worldwide. 3GB RAM gives it plenty of hardware performance. Great for streaming Ultra HD videos and online high-performance Virtual Reality gaming. Spectrum Analyzer available (to check quality of cable connection etc). No built-in WiFi router (you will need to buy an external one). Netgear has been for long one of the best home networking brands. The San Jose, California based company is known for making high performance and reliable cable modems and routers for SOHO networks (home and small office) with a great example being the mesh Orbi series. The Netgear CM1000 is the company’s offering in DOCSIS 3.1 Gigabit Cable modem market. Although this model competes directly with the other two Gigabit modems that we discuss in this article, it has some slight disadvantages compared to Arris and Motorola modems as we will see later in this post. It is compatible with most, but not all, ISPs so make sure to call your provider first. You should note however that the Netgear CM1000 is one of the first modems that got fully compatible with the most popular Gigabit services, the Comcast Xfinity and Cox. Although it works with many other ISPs, it will certainly work flawlessly with Comcast and Cox on their Gig-speed packages. For example, the activation of this modem with Comcast Xfinity is done automatically because it is fully supported by this service. One of the first differences of CM1000 compared to the other two models is that it has one Gigabit Ethernet port and therefore it does not support link aggregation. It has a maximum download speed of 1 Gbps due to the fact that the LAN ethernet port is hardware limited to 1Gbps. Now don’t get me wrong here. One Gigabit per second is A LOT of bandwidth and will be more than enough for most home and office networks. 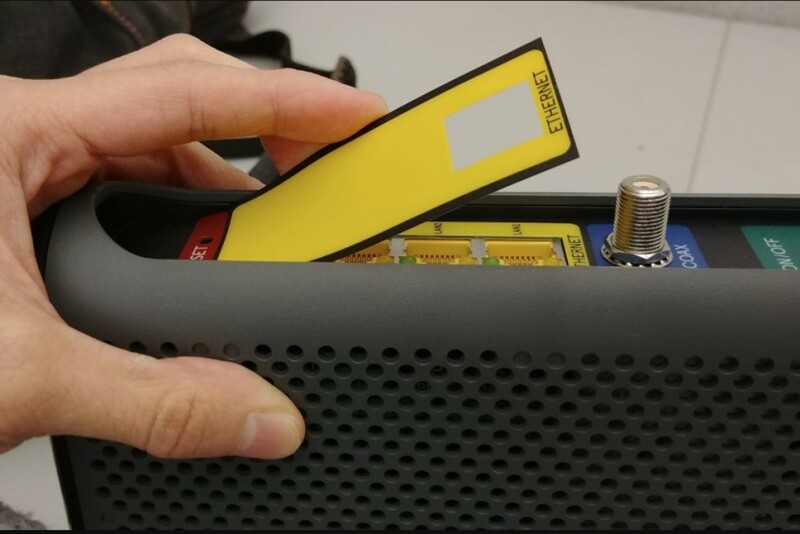 This device supports a digital data encoding method called OFDM (orthogonal frequency division multiplexing), which helps minimize latency in DOCSIS 3.1 modems. So you will get less time lags and faster site load speeds when browsing the internet. This is a DOCSIS 3.1 feature so the other two modems in this comparison article support this feature as well. Just like every other cable modem, you will MOST PROBABLY need a WiFi router to be connected to its LAN Gigabit Ethernet port as shown above. This is a requirement if you want to share the Internet line with multiple home devices connected to the wireless router. This Netgear device is well ventilated and does not get hot even when you use it heavily for hours. Also, this device is easy to set up – just a matter of plug and play. Fully compatible with Comcast XFINITY and Cox (and many others). Uses the Broadcom BCM3390 chipset which is very stable. Netgear devices are usually reliable and high quality. Only 1 x Gigabit Ethernet Port (not future-proof). No access to Spectrum Analyzer. Only 256MB RAM (may be limiting in some situations). This modem has the “heavy-weight” Motorola name printed on its box but its actually manufactured by Zoom Telephonics which is a USA company (based in Boston) that designs and manufactures high-quality networking and communication products. The Motorola MB8600 is a seriously good Gigabit internet modem and perhaps the fastest from the three models we are reviewing here. It has the same hardware chipset as the bestselling Arris SB8200 except for the fact that it has 4 Ethernet ports compared to 2 of Arris SB8200 and 1 of CM1000. Although the actual download speed is 1 Gigabit, this modem can theoretically support up to an excellent download speed of 3.8 Gbps if the ISP supports this bandwidth in the future (and by using Link Aggregation of course). But we can’t think of even one ISP that provides such high-speed internet plans currently. This is very much for the future. The Motorola MB8600 supports the Active Queue Management (AQM) technology, which reduces Internet latency. It is easily one of the most advanced DOCSIS 3.1 modem you can buy right now. Its chipset is also the Broadcom BCM3390, just like the previous models above, thus ensuring stable and bug-free operation. This modem is perfect for those who spend a lot of time on the internet streaming UHD quality videos and playing demanding games online. Just like the previous models, the Motorola MB8600 is fully approved and compatible with Comcast Xfinity, Xfinity X1, Cox, and CableOne with their Gigabit internet packages. Moreover, is supported by WOW, Grande Communications, Charter Spectrum etc. 4 x Gigabit Ethernet ports (best future-proof modem). Fully compatible with Comcast XFINITY, Cox, WOW, Spectrum etc. Provides access to Spectrum Analyzer of the chipset via Web GUI. The manufacturer (Zoom Tel) is USA based and highly regarded in the communications industry. Arris SB8200 and Netgear CM1000 are both exceptional cable modems and among the first to be built according to the latest DOCSIS 3.1 technology. Both modems have 32 download channels and 8 upload channels, and offer super-fast Gigabit internet. But there are a few differences between them. Let’s see what they are below. The major difference in design is that the Arris SB8200 is white and looks better in our opinion compared to the black finish of Netgear CM1000. For both models, the buttons, ports and indicators are all well positioned and the design is simple but elegant. The difference is SB8200 has two Ethernet ports while CM1000 has only one which is one of the major advantages of Arris. On the other hand, CM1000 has better ventilation and doesn’t get heated up as easily. Apart from that, there really isn’t much to choose between them as far as the design and build quality are concerned. Both Arris and Netgear modems are powered by a Broadcom BCM3390 chipset, which is considered to be the best and most stable in the industry for gigabit devices. Both modems deliver top speed and performance when connected to a Gigabit Internet service. But there is a difference here: the Arris modem is future-proof and can give you an upload and download speed of up to 2Gbps (maximum). Netgear has a maximum upload and download speed of only 1 Gbps. Both modems are easy to set up. In fact, the set up is as simple as plug and play with both devices and maybe you will need to call the ISP for registering the device. Also, you can view the status of the device through a web based Interface for both of them. The difference is, Arris comes with a unique feature called Spectrum Analyzer, which allows for monitoring the connection of the cable line. This is usually accessible at 192.168.100.1 port 8080. Netgear does not allow access to the Spectrum Analyzer. Arris SB8200 and Netgear CM1000 are both pretty good cable modems and similar in many respects. But the Arris modem has better support for higher upload and download speeds for the future, has two Ethernet ports, is easier to set up with the Spectrum Analyzer and is more future-proof than the Netgear modem. In our opinion, these two modems are the best from the three we are reviewing here. Both Arris SB8200 and Motorola MB8600 are exceptional DOCSIS 3.1 modems and there aren’t many notable differences so we’ll have to look at little details to decide the winner. They are both reliable, are manufactured by two great companies and they come with a 2-year manufacturer warranty. So what’s the difference? The Arris modem comes with 2 Gigabit Ethernet ports while the Motorola modem has 4 Gigabit Ethernet ports. This is the biggest difference. Why is this important? The Motorola modem has an edge over the Arris device as each of its four Ethernet ports carries data of 1 Gbps and supports link aggregation. This allows the MB8600 to offer a top download speed of 3.8 Gbps in the future – much faster than the 2 Gbps that can be offered by Arris SB8200. Again, the above is not directly supported currently from ISPs. It will most probably be a service upgrade of the near future from ISPs (I estimate these speed upgrade changes to take place near 2020). Not much difference here. Both cable modems have a very simple set up – just plug the device into the cable, call the ISP customer support, give them the MAC Address on the modem. That should be enough to activate the modem and get it running. Both the Arris and Motorola modems are powered by the Broadcom BCM3390 chipset, considered to be the best for DOCSIS 3.1 devices. It’s a tie here. Both the SB8200 and MB8600 have very good build quality, but couldn’t be more different as far as their designs are concerned. The Arris modem is smaller, while the Motorola modem is bigger in size. The Motorola modem comes with three additional Ethernet ports (hidden behind a plastic label). Moreover, the Arris modem does not have a physical power button. As discussed earlier, the MB8600 modem has 4 Ethernet ports, which allows it to offer a potential download speed of 3.8 Gbps. SB8200 only gives you a maximum theoretical speed of 2 Gbps. But practically speaking, that doesn’t really matter as it’s hard to find an ISP that gives you anything more than 1 Gbps of internet speed. There’s much to like about both the Motorola and Arris cable modems discussed here. They are both similar in a lot of ways, but different in some other ways. Which is the better modem of the two? That depends on what you’re looking for. If you want a modem that is really future-proof, then go with MB8600 from Motorola – you can’t get a more future-proof modem than that. But if you want something more practical and smaller for your home networking requirements, go with the Arris SB8200. It’s really up to you. Sure, the Motorola modem may offer potentially higher upload and download speeds, but the SB8200 is more homely, if you get what I mean. We have reviewed both the Netgear CM1000 and Motorola MB8600 cable modems and compared them with the Arris SB8200. So how do they compare against each other? There are more differences than similarities between the two. Let’s see what they are. The Netgear cable modem has only 1 Ethernet port while Motorola has 4. This means the MB8600 could potentially give you a speed of 3.8 Gbps, at 1 Gbps per port. The Netgear device on the other hand, can’t give you anything more than 1 Gbps. Also, the Motorola device supports Link Aggregation or Port Bonding, which means it can use all 4 ports if it needs to. This is something for the future, of course. Both the Motorola and the Netgear device are easy to set up. The set up and installation is similar for both modems. Just plug them into the cable, look for the MAC Address printed on a sticker attached to the bottom of the modem, call the customer support, give them the code and ask them to activate the modem. That should be enough to get the modem working. Both the Netgear CM1000 and Motorola MB8600 have an excellent build quality, decent ventilation and designed in a way to dissipate heat efficiently. The Motorola modem is slightly bigger than Netgear. There really isn’t much to choose between them as far as the design is concerned. Both of the modems use a Broadcom chip, which offers a measure of protection against the latency bug. As said earlier, the Motorola modem offers a top theoretical speed of 3.8 Gbps while the Netgear modem gives you a top download speed of 1 Gbps only. So we have a clear winner here. But really, this is for the future. As of today, you’d be lucky to get anything close to 1 Gbps from your ISP. To be fair, both MB8600 and CM1000 are pretty good modems, but we have to pick just one winner here. Motorola wins because it has 4 Ethernet ports and supports link aggregation, which makes it more future-proof than the Netgear device. Now, let’s quickly discuss the things to keep in mind when buying a cable modem, especially in this era of Gigabit internet speeds. Here are some of the factors to consider when buying a cable modem for your home or office network. These are the days of superfast Gigabit internet. The fiber networks and the newest Cable services of today are capable of delivering incredible gigabit speeds. High-speed internet connections are commonplace now. The big challenge, however, is to get the right cable modem and other equipment which are optimized for such speeds in order to deliver super-fast internet to your home. Gigabit technology is a relatively recent innovation, which is why there still aren’t that many cable modems that are capable of supporting high speeds. The three cable modems reviewed here are fully capable of delivering Gigabit internet to you, wherever you are. They have been designed to package the data in a more efficient manner and deliver the speeds that you’ve paid for. Every cable modem is associated with a DOCSIS protocol. Modern modems, such as those reviewed here, use the DOCSIS 3.1 protocol. What is DOCSIS and why is it important? DOCSIS is expanded as “Data Over Cable Service Interface Specification.” It’s a protocol according to which internet is delivered through a coaxial cable by your ISP. DOCSIS 3.1 is the most current version of this protocol. DOCSIS 3.1 cable modems are better suited to the new era of Gigabit internet than the earlier version of DOCSIS 3.0 modems. Remember: 1 Gbps (gigabit per second) = 1,000 Mbps (megabits per second). If your broadband speed is around 100 Mbps or less, as it is in many countries, then you might as well choose a DOCSIS 3.0 modem and you will be just fine. There is a number of downstream and upstream channels associated with every modem. It could be 8 x 4 or 32 x 8, or something in between. These numbers indicate the number of downstream and upstream channels that the modem is capable of supporting (bonded channels). The number to the left of “x” represents the downstream channels, while that to the right of “x” represents the upstream channels. Every modem supports more downstream channels than upstream channels because the downloading traffic is much higher than the uploading traffic. Make sure your modem has at least 16 downstream channels. Moreover, talk to your ISP first to make sure they support the number of bonded channels we’ve talked above. If there is one thing you should know about your modem, it’s the download speed. Upload speed is also important, but not as much as the download speed. When the manufacturer says that their modem gives you a speed of 1 Gbps, then they’re talking about the download speed. Upload speeds are always lower than the download speeds. It makes sense to buy a modem with high upload or download speeds, even if your internet is not really that quick. This way, you won’t have to change your modem when your ISP starts delivering faster internet. This is called as “future proofing” your modem. Is your modem compatible with your ISP? If not, then there is no point in buying it, right? Just a waste of money. Be 100% sure that a particular cable modem is compatible with your ISP if you want to buy it. Just go to your ISP’s website; there you will find a list of approved modems. Or you could just call your ISP’s customer support and ask them directly about the modems that are compatible with their broadband internet service.